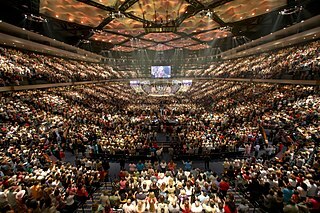 Worship service at Lakewood Church, Houston, Texas, United States, in 2013. Contemporary worship is a defining feature that sets evangelicals apart from mainline Protestants. Evangelicalism ( /ˌiːvænˈdʒɛlɪkəlɪzəm,_ˌɛvænʔ,_ʔən/), evangelical Christianity, or evangelical Protestantism,[lower-alpha 1] is a worldwide, crossdenominational movement within Protestant Christianity which maintains the belief that the essence of the Gospel consists of the doctrine of salvation by grace through faith in Jesus Christ's atonement. Evangelicals believe in the centrality of the conversion or the "born again" experience in receiving salvation, in the authority of the Bible as God's revelation to humanity, and in spreading the Christian message. The movement has had a long presence in the Anglosphere before spreading further afield in the 19th, 20th and early 21st centuries. The United States has the largest concentration of evangelicals in the world. Based mostly in the Bible Belt, US evangelicals are a quarter of the nation's population and politically important. In Great Britain, evangelicals are represented mostly in the Methodist Church, Baptist communities, and among evangelical Anglicans. Evangelicalism, a major part of popular Protestantism,[lower-alpha 2] is among the most dynamic religious movements in the contemporary world. While evangelicalism is on the rise globally, developing countries have particularly embraced it; it is the fastest growing portion of Christianity. In the English-speaking world, evangelical was commonly applied to describe the series of revival movements that occurred in Britain and North America during the late eighteenth and early nineteenth centuries. Christian historian David Bebbington writes that, "Although 'evangelical', with a lower-case initial, is occasionally used to mean 'of the gospel', the term 'Evangelical', with a capital letter, is applied to any aspect of the movement beginning in the 1730s." According to the Oxford English Dictionary, evangelicalism was first used in 1831. In the early 20th century, there was a decline of evangelical influence within mainline Protestantism and the development of Christian fundamentalism as a distinct religious movement. During the second half of the century, a mainstream evangelical consensus developed that sought to be more inclusive and more culturally relevant than fundamentalism, while maintaining conservative Protestant teaching. According to Brian Stanley, professor of world Christianity, this new postwar consensus is termed neo-evangelicalism, the new evangelicalism, or simply evangelicalism in the United States, while in Great Britain and in other English-speaking countries, it is commonly termed conservative evangelicalism. Over the years, less conservative evangelicals have challenged this mainstream consensus to varying degrees. Such movements have been classified by a variety of labels, such as progressive, open, post-conservative, and post-evangelical. Fundamentalism (sometimes known as conservative evangelicalism) regards biblical inerrancy, the virgin birth of Jesus, penal substitutionary atonement, the literal resurrection of Christ, and the Second Coming of Christ as fundamental Christian doctrines. Fundamentalism arose among evangelicals in the 1920s to combat modernist or liberal theology in mainline Protestant churches. Failing to reform the mainline churches, fundamentalists separated from them and established their own churches, refusing to participate in ecumenical organizations such as the National Council of Churches. They also made separatism (rigid separation from non-fundamentalist churches and culture) a true test of faith. According to historian George Marsden, most fundamentalists are Baptists and dispensationalist. Mainstream evangelicalism is historically divided between two main orientations: confessionalism and revivalism. These two streams have been critical of each other. Confessional evangelicals have been suspicious of unguarded religious experience, while revivalist evangelicals have been critical of overly intellectual teaching that (they suspect) stifles vibrant spirituality. In an effort to broaden their appeal, many contemporary evangelical congregations intentionally avoid identifying with any single form of evangelicalism. These "generic evangelicals" are usually theologically and socially conservative, but their churches often present themselves as nondenominational within the broader evangelical movement. The emphasis on historic Protestant orthodoxy among confessional evangelicals stands in direct contrast to an anti-creedal outlook that has exerted its own influence on evangelicalism, particularly among churches strongly influenced by revivalism and by pietism. Revivalist evangelicals are represented by some quarters of Methodism, the Wesleyan Holiness churches, the Pentecostal/charismatic churches, some Anabaptist churches, and some Baptists and Presbyterians. Revivalist evangelicals tend to place greater emphasis on religious experience than their confessional counterparts. Evangelicals dissatisfied with the movement's conservative mainstream have been variously described as progressive evangelicals, post-conservative evangelicals, Open Evangelicals and post-evangelicals. Progressive evangelicals, also known as the evangelical left, share theological or social views with other progressive Christians, while also identifying with evangelicalism. Progressive evangelicals commonly advocate for women's equality, pacifism and social justice. 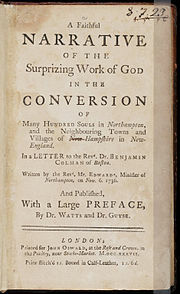 The first local revival occurred in Northampton, Massachusetts, under the leadership of Congregationalist minister Jonathan Edwards. In the fall of 1734, Edwards preached a sermon series on "Justification By Faith Alone", and the community's response was extraordinary. Signs of religious commitment among the laity increased, especially among the town's young people. The revival ultimately spread to 25 communities in western Massachusetts and central Connecticut until it began to wane by the spring of 1735. Edwards was heavily influenced by Pietism, so much so that one historian has stressed his "American Pietism." One practice clearly copied from European Pietists was the use of small groups divided by age and gender, which met in private homes to conserve and promote the fruits of revival. 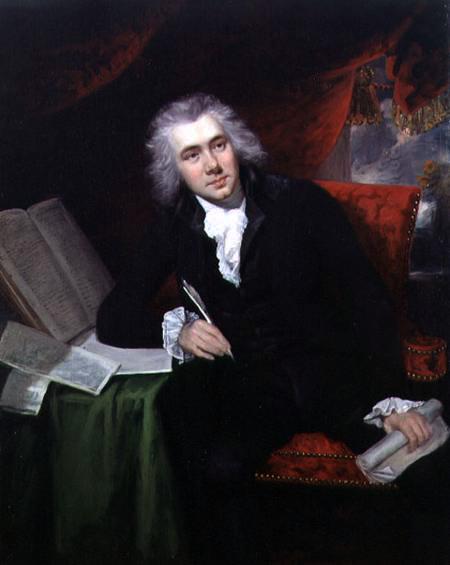 In Britain in addition to stressing the traditional Wesleyan combination of "Bible, cross, conversion, and activism," the revivalist movement sought a universal appeal, hoping to include rich and poor, urban and rural, and men and women. Special efforts were made to attract children and to generate literature to spread the revivalist message. In the post–World War II period a split developed between Evangelicals as they disagreed among themselves about how individual Christians ought to respond to an unbelieving world. ManyTemplate:Quantify Evangelicals urged that Christians must engage "the culture" directly and constructively, and they began to express reservations about being known to the world as fundamentalists. As Kenneth Kantzer put it at the time, the name fundamentalist had become "an embarrassment instead of a badge of honor". The closing years of the 20th century saw controversial postmodern influences entering some parts of Evangelicalism, particularly with the emerging church movement. In the 21st century, there are Evangelical churches active in Sudan, Angola, Mozambique, Zimbabwe, Malawi, Rwanda, Uganda, Ghana, Kenya, Zambia, South Africa, and Nigeria. They have grown especially since independence came in the 1960s, the strongest movements are based on Pentecostal-charismatic beliefs, and comprise a way of life that has led to upward social mobility and demands for democracy. There is a wide range of theology and organizations, including some sponsored by European missionaries and others that have emerged from African culture such as the Apostolic and Zionist Churches which enlist 40% of black South Africans, and their Aladura counterparts in western Africa. In Nigeria the Evangelical Church Winning All (formerly "Evangelical Church of West Africa") is the largest church organization with five thousand congregations and over three million members. It sponsors two seminaries and eight Bible colleges, and 1600 missionaries who serve in Nigeria and other countries with the Evangelical Missionary Society (EMS). There have been serious confrontations since 1999 between Muslims and Evangelical Christians standing in opposition to the expansion of Sharia law in northern Nigeria. The confrontation has radicalized and politicized the Christians. Violence has been escalating. In Kenya, mainstream Evangelical denominations have taken the lead in promoting political activism and backers, with the smaller Evangelical sects of less importance. Daniel arap Moi was president 1978 to 2002 and claimed to be an Evangelical; he proved intolerant of dissent or pluralism or decentralization of power. The East African Revival was a renewal movement within Evangelical churches in East Africa during the late 1920s and 1930s that began at a Church Missionary Society mission station in the Belgian territory of Ruanda-Urundi in 1929, and spread to: Uganda, Tanzania and Kenya during the 1930s and 1940s contributing to the significant growth of the church in East Africa through the 1970s and had a visible influence on Western missionaries who were observer-participants of the movement. Protestant missionary activity in Asia was most successful in Korea. American Presbyterians and Methodists arrived in the 1880s and were well received. Between 1910 and 1945, when Korea was a Japanese colony, Christianity became in part an expression of nationalism in opposition to Japan's efforts to promote the Japanese language and the Shinto religion. In 1914, out of 16 million people, there were 86,000 Protestants and 79,000 Catholics; by 1934, the numbers were 168,000 and 147,000. Presbyterian missionaries were especially successful. Since the Korean War (1950–53), many Korean Christians have migrated to the U.S., while those who remained behind have risen sharply in social and economic status. Most Korean Protestant churches in the 21st century emphasize their Evangelical heritage. Korean Protestantism is characterized by theological conservatism coupled with an emotional revivalistic style. Most churches sponsor revival meetings once or twice a year. Missionary work is a high priority, with 13,000 men and women serving in missions across the world, putting Korea in second place just behind the US. Sukman argues that since 1945, Protestantism has been widely seen by Koreans as the religion of the middle class, youth, intellectuals, urbanites, and modernists. It has been a powerful force supporting South Korea's pursuit of modernity and emulation of the United States, and opposition to the old Japanese colonialism and to the authoritarianism of North Korea. Evangelicalism is a minor Christian denominations in the Philippines. According to the 2010 census, 2.68% of the Filipino Population are Evangelicals. However 2010 data such as Operation World and Joshua Project estimate the evangelical population to be at most 13% of the population. John Wesley (1703–1791) was an Anglican cleric and theologian who, with his brother Charles Wesley (1707–1788) and fellow cleric George Whitefield (1714 – 1770), founded Methodism. After 1791 the movement became independent of the Anglican Church as the "Methodist Connection." It became a force in its own right, especially among the working class. In the 21st century there are an estimated 2 million Evangelicals in the UK. According to research performed by the Evangelical Alliance in 2013, 87% of UK evangelicals attend Sunday morning church services every week and 63% attend weekly or fortnightly small groups. An earlier survey conducted in 2012 found that 92% of evangelicals agree it is a Christian's duty to help those in poverty and 45% attend a church which has a fund or scheme that helps people in immediate need, and 42% go to a church that supports or runs a foodbank. 63% believe a tithing, and so give around 10% of their income to their church, Christian organisations and various charities 83% of UK evangelicals believe that the Bible has supreme authority in guiding their beliefs, views and behaviour and 52% read or listen to the Bible daily. The Evangelical Alliance, formed in 1846, was the first ecumenical evangelical body in the world and works to unite evangelicals, helping them listen to, and be heard by, the government, media and society. By the late 19th to early 20th century, most American Protestants were Evangelicals. 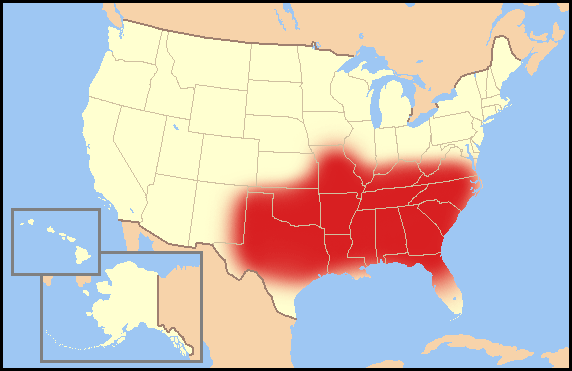 A divide had arisen between the more liberal-modernist mainline denominations and the fundamentalist denominations, the latter typically consisting of Evangelicals. During and after World War II, Evangelicals became increasingly organized. There was a great expansion of Evangelical activity within the United States, "a revival of revivalism." 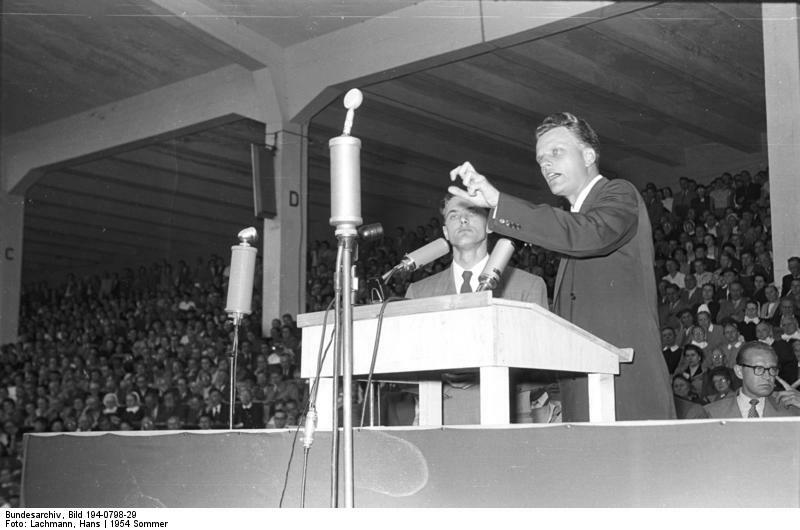 Youth for Christ was formed; it later became the base for Billy Graham's revivals. The National Association of Evangelicals formed in 1942 as a counterpoise to the mainline Federal Council of Churches. In 1942–43, the Old-Fashioned Revival Hour had a record-setting national radio audience. According to a Pew Forum on Religion and Public Life study, Evangelicals can be broadly divided into three camps: traditionalist, centrist, and modernist. A 2004 Pew survey identified Evangelicals as 26.3 percent of the population, while Catholics make up 22 percent and mainline Protestants make up 16 percent. ^ A flexible term; defined as all forms of Protestantism with the notable exception of the historical denominations deriving from the Protestant Reformation. ^ Johnson, Phil (2009-03-16). "The History of Evangelicalism". Pulpit Magazine. Archived from the original on 2010-06-16. https://web.archive.org/web/20100616020408/http://www.shepherdsfellowship.org/pulpit/Posts.aspx?ID=4111. ^ Gerstner, John H. (1975). "The Theological Boundaries of Evangelical Faith". In David P. Wells. The Evangelicals. John D. Woodbridge. Nashville: Abingdon Press. pp. 21–36. ISBN 0-687-12181-7. "Despite the dominant usage of euangellismos in the New Testament, its derivative, evangelical, was not widely or controversially employed until the Reformation period. Then it came into prominence with Martin Luther precisely because he reasserted Paul's teaching on the euangellismos as the indispensable message of salvation. Its light, he argued, was hidden under a bushel of ecclesiastical authority, tradition, and liturgy. The essence of the saving message for Luther was justification by faith alone, the article by which not only the church stands or falls but each individual as well. Erasmus, Thomas More, and Johannes Eck denigrated those who accepted this view and referred to them as 'evangelicals.'" ^ Gove, Philip Babcock, ed (1971). "Webster's Third New International Dictionary of the English Language". Webster's Third New International Dictionary of the English Language. Springfield, MA: G & C Merriam. ISBN 978-0-87779-101-0. "evangelical [...] 5 [...] characterized by or reflecting a missionary, reforming, or redeeming impulse or purpose [...] the rise and fall of evangelical fervor [sic] within the Socialist movement – Time Lit. Supp.>". ^ "Denominations". National Association of Evangelicals. https://www.nae.net/denominations/. ^ Harris, Harriet A. (1998). Fundamentalism and Evangelicals. Oxford: Clarendon Press. pp. 58–59. ISBN 978-0-19-826960-1. https://books.google.com/books?id=LXkSDAAAQBAJ. Retrieved 24 October 2017. "The overriding implication of Fundamentalism is that conservative evangelicals are in fact fundamentalist but that they reject the term because of its pejorative connotations: 'By what term would "fundamentalists" prefer to be called? The term favoured at present, at least in Great Britain, is "conservative evangelical"'." ^ Roger E. Olson, "Postconservative Evangelicals Greet the Postmodern Age", The Christian Century (May 3, 1995), pp. 480–483. Retrieved December 16, 2014. ^ Snead, Jennifer (2010), "Print, Predestination, and the Public Sphere: Transatlantic Evangelical Periodicals, 1740–1745", Early American Literature 45 (1): 93–118, doi:10.1353/eal.0.0092 . ^ Bebbington, David W (2007), "The Evangelical Conscience", Welsh Journal of Religious History 2 (1): 27–44 . ^ Bebbington, David W (1996), "The Holiness Movements in British and Canadian Methodism in the Late Nineteenth Century", Proceedings of the Wesley Historical Society 50 (6): 203–28 . ^ Sweetnam, Mark S (2010), "Defining Dispensationalism: A Cultural Studies Perspective", Journal of Religious History 34 (2): 191–212, doi:10.1111/j.1467-9809.2010.00862.x . ^ Compare: Henry, Carl FH (August 29, 2003) , The Uneasy Conscience of Modern Fundamentalism (reprint ed. ), Grand Rapids: Eerdmans, p. 80–81, ISBN 0-8028-2661-X, https://books.google.com/books?id=2WVu5YK20HUC, "[...] it remains true that the evangelical, in the very proportion that the culture in which he lives is not actually Christian, must unite with non-evangelicals for social betterment if it is to be achieved at all, simply because the evangelical forces do not predominate. To say that evangelicalism should not voice its convictions in a non-evangelical environment is simply to rob evangelicalism of its missionary vision." . ^ "Billy Graham Built a Movement. Now His Son Is Dismantling It.". POLITICO Magazine. https://www.politico.com/magazine/story/2018/02/24/billy-graham-evangelical-decline-franklin-graham-217077. ^ "WEA". World Evangelical Alliance. 2015. Archived from the original on 2015-03-15. https://web.archive.org/web/20150315215206/http://www.worldea.org/whoweare/introduction. Retrieved 2015-03-15. ^ "Lausanne Movement". Lausanne Committee for World Evangelization. 2015. Archived from the original on 2015-03-15. https://web.archive.org/web/20150315215457/http://conversation.lausanne.org/en/resources/detail/11972. Retrieved 2007-05-24. ^ Milne, Bruce (2010). Know the Truth: A Handbook of Christian Belief. InterVarsity Press. p. 332. ISBN 0-83082-576-2. https://books.google.com/?id=W_ttliPuhjQC&dq=%22population+rate%22+%22growth+rate%22+of+evangelical. Retrieved August 31, 2014. ^ Pakendorf, Gunther (2011), "A Brief History of the Berlin Mission Society in South Africa", History Compass 9 (2): 106–18, doi:10.1111/j.1478-0542.2009.00624.x . ^ van Dijk, Richard A (1992), "Young Puritan Preachers in Post-Independence Malawi", Africa (Edinburgh University Press) 62 (2): 159–81, doi:10.2307/1160453 . ^ Larsen, Timothy; Treier, Daniel J (12 April 2007). The Cambridge Companion to Evangelical Theology. Cambridge University Press. p. 261. ISBN 978-1-139-82750-8. https://books.google.com/books?id=vlmXBe0RPxYC&pg=PA261. Retrieved 14 July 2013. ^ "U.S. Hispanics Are Becoming Less Catholic". Time. March 1, 2013. http://swampland.time.com/2013/03/01/us-hispanics-are-becoming-less-catholic/. Retrieved 14 July 2013. ^ "Religion in Latin America: Hola, Luther". The Economist. November 8, 2008. http://www.economist.com/node/12564066. Retrieved 14 July 2013. ^ Leonard, Émil-G (1963) (in Portuguese), O Protestantismo Brasileiro, São Paulo: ASTE . ^ Testa, Michael (1964). "Part 2: Portuguese Protestants in the Americas". Journal of Presbyterian History 42: 244–71. .
^ Burdick, John (2005), "Why is the Black Evangelical Movement Growing in Brazil? ", Journal of Latin American Studies 37 (2): 311–32, doi:10.1017/s0022216x05009028 . ^ Chesnut, R. Andrew (1999), "The Salvation Army or the Army's Salvation? : Pentecostal Politics in Amazonian Brazil, 1962–1992", Luso-Brazilian Review 36 (2): 33–49 . ^ Birman, Patrícia; Leite, Márcia Pereira (2000), "Whatever Happened to What Used to Be the Largest Catholic Country in the World? ", Daedalus 129 (2): 271–90 . ^ Londono, Diana (Dec 5, 2012), "Evangelicals in Brazil", Hemispheric Affairs (Coha), http://www.coha.org/evangelicals-in-brazil/ . ^ Antunes, Anderson (Jan 17, 2013), "The Richest Pastors in Brazil", Forbes, https://www.forbes.com/sites/andersonantunes/2013/01/17/the-richest-pastors-in-brazil/ . ^ Jacob, CR; Hees, DR; Waniez, P; Brustlein, V (2003) (in Portuguese), Atlas da Filiação Religiosa e Indicadores Sociais no Brasil, São Paulo, Rio de Janeiro: PUC-Rio, Edições Loyola, ISBN 85-15-02719-4 . ^ Kane, Danielle; Park, Jung Mee (2009), "The Puzzle of Korean Christianity: Geopolitical Networks and Religious Conversion in Early Twentieth-Century East Asia", American Journal of Sociology 115 (2): 365–404, doi:10.1086/599246 . ^ Ryu, Dae Young (2008), "The Origin and Characteristics of Evangelical Protestantism in Korea at the Turn of the Twentieth Century", Church History 77 (2): 371–98, doi:10.1017/S0009640708000589 . ^ (2004) "Historical Currents and Characteristics of Korean Protestantism after Liberation". Korea Journal 44 (4): 133–156. ^ Samuel P. Huntington (2007). The Clash of Civilizations and the Remaking of World Order. p. 101. ISBN 9781416561248. https://books.google.com/books?id=LO4xG-bH1CQC&pg=PA101. ^ Sukman, Jang (2004), "Historical Currents and Characteristics of Korean Protestantism after Liberation", Korea Journal 44 (4): 133–56 . ^ Ferguson, Tessa (March 9, 2011). "Professor explains religion's popularity in South Korea". ASU News. Arizona State University: The State Press. http://www.statepress.com/2011/03/09/professor-explains-religion%E2%80%99s-popularity-in-south-korea/. Retrieved 2013-07-25. ^ "Missions Incredible". Christianity Today. 2006-01-03. http://www.christianitytoday.com/ct/2006/march/16.28.html. Retrieved 2013-07-25. ^ "Born Again: Evangelicalism in Korea". Hawai'i: UH Press. 2013-06-14. http://www.uhpress.hawaii.edu/p-6208-9780824833756.aspx. Retrieved 2013-07-25. ^ Project, Joshua. "Philippines :: Joshua Project". https://joshuaproject.net/countries/RP. ^ "Philippines | Operation World". http://www.operationworld.org/phil. ^ Luo, Michael (2006-04-16). "Evangelicals Debate the Meaning of 'Evangelical'". The New York Times. https://www.nytimes.com/2006/04/16/weekinreview/16luo.html?_r=1&adxnnlx=1145227368-p%20hJwvCXS0qceSTw%20jLi8w&pagewanted=all. ^ Green, John C.. "The American Religious Landscape and Political Attitudes: A Baseline for 2004" (PDF) (survey). The Pew forum. Archived from the original on 2009-03-04. https://web.archive.org/web/20090304020453/http://pewforum.org/publications/surveys/green-full.pdf. ^ Dudley, Jonathan (2011). Broken Words: The Abuse of Science and Faith in American Politics. Crown Publishing Group. ISBN 978-0-385-52526-8. https://books.google.com/?id=UHIWXheyNuEC&dq=ISBN9780385525268. Retrieved February 24, 2015. .
^ "Ten Major Court Cases about Evolution and Creationism". National Center for Science Education. 2001. ISBN 978-0-385-52526-8. http://ncse.com/taking-action/ten-major-court-cases-evolution-creationism. Retrieved March 21, 2015. .
^ Smith, Christian (2002). Christian America? : What Evangelicals Really Want. p. 207. ^ Limbaugh, David (2003). Persecution: How Liberals are Waging War Against Christians. Regnery. ISBN 0-89526-111-1. https://books.google.com/books?id=p7nNBpEIrtYC. Balmer, Randall Herbert (2002), Encyclopedia of Evangelicalism, Louisville, KY: Westminster John Knox Press, ISBN 978-0-664-22409-7, https://books.google.com/books?id=syUupeVJOz4C, retrieved October 25, 2011 . Chesnut, R. Andrew (1997), Born Again in Brazil: The Pentecostal Boom and the Pathogens of Poverty, Rutgers University Press, ISBN 9780813524061, https://books.google.com/books?id=vSL31stk6JgC . Balmer, Randall Herbert (2004) (excerpt and text search), Encyclopedia of Evangelicalism (2nd ed. ), ISBN 9780664224097, https://books.google.com/books?id=syUupeVJOz4C ; online. (2010), The Making of Evangelicalism: From Revivalism to Politics and Beyond, ISBN 978-1-60258-243-9 . Bastian, Jean-Pierre (1994) (in French), Le Protestantisme en Amérique latine: une approche sio-historique, Histoire et société, Genève: Labor et Fides, ISBN 2-8309-0684-5 ; alternative ISBN on back cover, 2-8309-0687-X; 324 pp. Carpenter, Joel A. (1980), "Fundamentalist Institutions and the Rise of Evangelical Protestantism, 1929–1942", Church History 49: 62–75, doi:10.2307/3164640 . (1999), Revive Us Again: The Reawakening of American Fundamentalism, Oxford University Press, ISBN 0-19-512907-5 . Case, Jay Riley (2012). An Unpredictable Gospel: American Evangelicals and World Christianity, 1812-1920. Oxford UP. ISBN 9780199772322. https://books.google.com/books?id=Amjf9qHlFigC. Marsden, George M (1991), Understanding Fundamentalism and Evangelicalism . (1987), Reforming Fundamentalism: Fuller Seminary and the New Evangelicalism, Grand Rapids: William B. Eerdmans . Pierard, Richard V. (1979), "The Quest For the Historical Evangelicalism: A Bibliographical Excursus", Fides et Historia 11 (2): 60–72 . Price, Robert M. (1986), "Neo-Evangelicals and Scripture: A Forgotten Period of Ferment", Christian Scholars Review 15 (4): 315–30 . Wright, Bradley (March 21, 2013), What, exactly, is Evangelical Christianity?, series on Evangelical Christianity in America, Patheos (Black, White and Gray blog), http://www.patheos.com/blogs/blackwhiteandgray/2013/03/what-exactly-is-evangelical-christianity/ . Bainbridge, William F (1882), Around the World Tour of Christian Missions: A Universal Survey, https://books.google.com/books?id=fZ5FAAAAIAAJ , 583 pp. Brown, Candy Gunther, ed. (2011), Global Pentecostal and Charismatic Healing, Oxford UP , 400 pp. Latourette, Kenneth Scott, A History of the Expansion of Christianity, (1938–45) , 7 volumes. Newcomb, Harvey (1860) (Google Books), A Cyclopedia of Missions: Containing a Comprehensive View of Missionary Operations Throughout the World with Geographical Descriptions, and Accounts of the Social, Moral, and Religious Condition of the People, https://books.google.com/books?id=Ob8Ix77t5cEC , 792 pp. (1988), Guardians of the Great Commission . Institute for the Study of American Evangelicalism, Wheaton College, http://www.wheaton.edu/isae/ . Spencer, Michael (March 10, 2009), "The Coming Evangelical Collapse", The Christian Science Monitor, http://www.csmonitor.com/2009/0310/p09s01-coop.html . Modern Evangelical African Theologians: A Primer, Need not fret, http://www.neednotfret.com/content/view/211/47/ . American Evangelicalism and Islam: From the Antichrist to the Mahdi, Germany: Qantara, http://en.qantara.de/content/american-evangelicalism-and-islam-from-the-antichrist-to-the-mahdi . Operation World, http://www.operationworld.org/ – Statistics from around the world including numbers of Evangelicals by country.